I found this item profoundly useful as it leads back to my clear construction of the Universe as a thought experiment from first principles. I am not sure if we should be using the concept of a fractal universe quite yet. At the same time, it is inherent that the content of the universe will scale up in the same way as its smallest component. The universe, or at least my model of it, is remorselessly geometric. Thus all this holds and conforms. What is missing is a working geometric framework to actually build out the ideas. Thus we get to look at pretty patterns instead. That is what I have produced in Cloud Cosmology and my Mathematica. Welcome to the first issue of Ascend Academy. Brace yourselves, we are about to delve into the mother lode of all spiritual concepts. This article reveals the meaning behind the 7 Hermetic Principles of truth, directly from their source, The Kybalion. I am about to present some very powerful information to you that may stir up a lot of discussion, and possibly opposition. These seven principles are considered to be ABSOLUTE TRUTHS, and many ancient and current hermeticists, mystics, philosophers and so called enlightened beings regard it’s application to be THE Master key path to understanding the self and it’s relation to all that is. If you feel within yourself that you are not ready to handle this information, feel free to come back and read when you are. These teachings have been kept secret for thousands of years by the Hermetic tradition, only being passed between master and initiate of countless different occult societies across human history. This was out of fear that this information would be used by those who did not quite understand it’s significance, or who had selfish intentions and lack of wisdom. In 1912, it was published by an anonymous entity known as the Three Initiates(?) and has since been put into public domain, now widely available online. I believe that this knowledge should be widespread so that we can begin implementing and spreading it’s profound wisdom and applications for the ascension of mankind as a whole. It is clear that the ancient masters did not wish for these principles to be ‘crystallized into creeds by any country or religious sect’. So while viewing this information, HAVE YOUR OWN EXPERIENCE, and consider this to be a pragmatic philosophy for understanding the spiritual reality. The All, or the Universal Infinite Living Mind is the notion which we consider God or Source Consciousness, and because we are within this infinite mind, it pervades the entirety of every single space, physical or non physical. In essence, each person or form of consciousness is equivalent to a dream figure in the lucid dream of God. I understand this is a large concept to swallow, bear with me! If you have ever lucid dreamed, you would know that when you ask a person in your dream who they are or what they represent, they will actually tell you that they are some facet of your consciousness. You would also know that a lot of times your dream figures will tell you that their experience is not a dream at all. Some are more or less aware of their roles in your psychological make up. Likewise, each one of us is an aspect of God’s mind in that same way; a symbol of a complex concept being expressed in a microcosmic form. For those who have not lucid dreamed, think of it as this whole universe is an organism, matter and energy are the cells, and we as forms of consciousness are the neurons. Coming into this knowledge is the most fundamental key to understanding and expanding our consciousness as well as traversing the higher planes of reality. We must understand that we, and literally everything and everyone else, IS Spirit, or fractal facets of it’s consciousness. It is important that we apply this understanding in our daily interactions with others, understand that all other beings are simply another aspect of an infinite, complex, and extremely variant consciousness, and are just as much of an expression of it as you are no matter what form they take. Allow yourself to be without judgement towards others with this understanding. Eventually this will cultivate a mindset of unconditional love towards all life. With this principle we become aware of the fractal nature of the universe in which a similar pattern of phenomena repeats across all scales of existence. This phenomena can be synonymous with the musical note octaves on a piano, in that each note is repeated in the next set or dimensional plane with the same vibrational quality but on a higher frequency. Understanding vibrational frequency and it’s application in our spirituality is crucial. When we are dealing with negative thoughts, emotions, and beliefs, we must grasp that these things are dense vibrations within our minds, keeping us in a low vibratory rate of consciousness. If they are vibrating, they are emitting sound, light, or rippling out in some form of wave. If we are constantly emitting these sorts of vibrations, our outside world, which is essentially still MIND, will resonate with our mental experience, causing those same sorts of low vibrational experiences to manifest physically. In the same way, if we are radiating positive, loving, and blissful forms of vibration, our reality will follow suite. Essentially, everything in existence interacts with it’s components through rates of vibration. Dimensions, in a simplistic way of understanding, are different octaves of vibration, in which the consciousness inhabiting those octaves perceive things relevant to their mental state, perspectives, beliefs, and level of awareness. This is why many of us cannot see the astral plane or things like ghosts, auras, and spiritual entities, because we are not vibrating at the same rate as them and cannot resonate with those experiences. Our minds are like radio tuners for different channels of experience. We can turn the dial by shifting our attention and intention towards different actions, different thoughts, different mental states and different beliefs about our reality. Reading this right now is essentially tuning you to the frequency of these higher planes, expanding your awareness to allow your mind to resonate with their concepts, and thus allowing you to hold consciousness within them. ‘This Principle embodies the truth that “everything is dual”; “everything has two poles”; “everything has its pair of opposites,” all of which were old Hermetic axioms. It explains the old paradoxes, that have perplexed so many, which have been stated as follows: “Thesis and anti-thesis are identical in nature, but different in degree”; “opposites are the same, differing only in degree”; “the pairs of opposites may be reconciled”; “extremes meet”; “everything is and isn’t, at the same time”; “all truths are but half-truths”; “every truth is half-false”; “there are two sides to everything,” etc., etc., etc. It explains that in everything there are two poles, or opposite aspects, and that “opposites” are really only the two extremes of the same thing, with many varying degrees between them. To illustrate: Heat and Cold, although “opposites,” are really the same thing, the differences consisting merely of degrees of the same thing. Look at your thermometer and see if you can discover where “heat” terminates and “cold” begins! There is no such thing as “absolute heat” or “absolute cold” — the two terms “heat” and “cold” simply indicate varying degrees of the same thing, and that “same thing” which manifests as “heat” and “cold” is merely a form, variety, and rate of Vibration. So “heat” and “cold” are simply the “two poles” of that which we call “Heat” — and the phenomena attendant thereupon are manifestations of the Principle of Polarity. With the concept that extreme opposites are simply the poles of the same thing, we can cease to have a dualistic perspective and instead view these phenomena as spectrums or sliding scales of vibration. Once we understand that, we can begin to use what is called Mental Alchemy or Mental Transmutation. Unlike the traditional view of Alchemy in which you change different base or undesirable metals into Gold, we polarize the negative thoughts, emotions, and mental states into positive ones (The prior definition being a hidden allegory for the true meaning). This is one particular field that I will be continuing to study and give you my interpretation of so that you can all benefit. It will probably be one of our last topics discussed in this series, as it can profoundly change our perspective and our experience and must be used with sufficient knowledge. ‘This Principle embodies the truth that in everything there is manifested a measured motion, to and fro; a flow and inflow; a swing backward and forward; a pendulum-like movement; a tide-like ebb and flow; a high-tide and low-tide; between the two poles which exist in accordance with the Principle of Polarity described a moment ago. There is always an action and a reaction; an advance and a retreat a rising and a sinking. This is in the affairs of the Universe, suns, worlds, men, animals, mind, energy, and matter. This law is manifest in the creation and destruction of worlds; in the rise and fall of nations; in the life of all things; and finally in the mental states of Man (and it is with this latter that the Hermetists find the understanding of the Principle most important). Rhythm is a direct result of the nature of vibration, as the oscillation between two poles in any given scale provides an environment in which energy can shift from one state to the next and back again with equal proportion. This teaches us of the importance of balance in the universe, because without rhythmic proportion, we are unable to measure and identify the different states that energy can move between and how they directly relate to one another. Another way to look at it is that this principle recognizes the heartbeat or the symphony of the universe. If we learn to ride these innate universal rhythms consciously, we can begin to work in harmony with the universal energies rather than have them work against us, being apart of the music or flowing with the current to achieve our conscious expansion. I have personally understood and used this principle to polarize into my higher self for long periods of time while denying my ego self reign over my thoughts, but this is far from mastering the principle. As we delve deeper into the series, we will explore this principle’s application together and maybe new ways of ‘rhythm riding’ can be unearthed. I think that this principle is common sense for most, but many are not aware that it applies on and connects all dimensions of reality. With this in mind we can begin to see how the universe came into being. The first cause, the Infinite Living Mind or Source, created a set of causes via VIBRATION to allow many ripples of subsequent events to intertwine and unfold. The causes on higher planes began manifesting effects on the lower planes, and our physical universe eventually unfolded in this way. It is easy to now view the phenomena of this world as having specific serendipitous purpose, even if we are not able to understand what exactly causes them. Synchronicity is a prominent example of higher plane causation in action, where almost divinely timed experiences manifest in peculiar patterns. 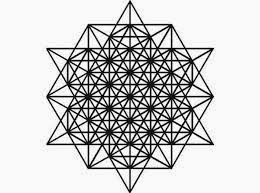 This principle is symbolically (as well as mathematically) represented in the construction of the Flower of Life geometry and it’s successive forms, as these are higher dimensional blueprints for the denser manifestations of matter to use as templates. Throughout the series, we will begin to work in accordance with these causes of higher planes, and create our own, rather than be subjected to the causes of this one. This is so we may become Movers rather than Pawns in this so called Chessboard of Life. In our next issue, we will dive further into this topic, exploring sacred geometry and it’s use as a form of mental causation and manifestation. Here on planet Earth, we are very familiar with the many manifestations of Male and Female energy, or Duality and Unity consciousness. The reason the Masculine and Feminine Principles are so integral to creation is because Source itself is a perfect union of these two concepts. All created things are but variations of expression, intensity, and vibration between these two forms of consciousness. The Male principle is the notion of Subjective Self or the internal, causal, and intangible nature. The Female principle is the notion of Objective Self, or the external, receptive, and form of that inner nature. Male is also the force of giving or push, and Female subsequently is the force of taking or pull. Do not confuse these definitions with gender discrimination. We as human beings are also a union of these two principles, as we possess an internal nature and an external form. Even our minds are split into conscious (male) and subconscious/unconscious (female) and our brains into left brain (male) and right brain (female). For more on this check out Spirit Science episode 4. You’re probably wondering why Jordan says that Male energy is Focussed and that the Female energy is Creative/Random. That is just another way this principle manifests in the human psyche, and there are a multitude of others. There is an even deeper level of understanding for the principle of Gender that will be revealed in the coming articles, so stay tuned. Now, if we wish to ascend as human beings, the goal is to balance these energies within ourselves, allowing us to resonate with that same balance present in the Infinite Living Mind, giving way to conscious freedom. This balance is largely achieved through, you guessed it, Unconditional Love, as this is an energy of freely giving and taking with all life through understanding that, as a fractal of Source consciousness, the external universe is also YOUR external form. And there you have it, the 7 Hermetic Principles. Study and Mastery of these fundamental laws will bring great wisdom as well as unbelievable power and freedom. If you have any questions regarding this article or any other spiritual inquiries, feel free to email ryan.boyd@live.ca or inbox Ryan Boyd. If you leave a comment below I can reply and you can also reach my Facebook that way. I won’t be accepting friend requests unless we have extensive interaction, but I will always try to help with your questions. Our next issue will begin with the spiritual framework that I have created in conjunction with these principles, formerly known as the 7 stages of Mystic Mastery. I am going to change it for the sake of brevity and clarity; it will now be known as the 7 Phases of Mastery. The first stage is called Geometry, and it will bring an understanding of the nature of Source and its manifestations through exploring Sacred Geometry, Mandalas, and an introduction to my own extension of these concepts known as Lightwebs. This article series will be bi-weekly, so see you in two weeks! Namaste, and thank you for reading.